"The overall ambience of the trip was outstanding, during visits to six cities we visited the Three Gorges Dam, the Terracotta Army, the Forbidden City, and the Great Wall, among a host of lesser known historical and cultural sites. 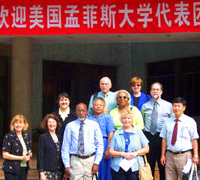 The tour was run flawlessly with superb accommodations, food, transportation and local guides.....it was a splendid job in promoting contact between The University of Memphis and Chinese universities." Obtain price quotes for your special interest group. You only need to check with our customers to know that our professional group agents can meet your special needs for your group to Asia. From educational and cultural exchange groups to business development groups -- your special interest group will benefit for the experience we have in making sure all the needs of your group are obtained. Custom itineraries designed for your special interest group, trade show and exhibitions, continuing educational seminars, conventions and conferences, and incentive reward travel are available to all over Asia. Leave the details and organization to Majestic Vacations. As a group organizer, you may be able to earn free travel for you or someone on your group by selling as few as 15 people traveling together. To learn more about this incentive as well as obtaining price quotes for your special interest group, please contact us at Sales@Majestic-Vacations.com or call us at 1-888-288-7528.